Located in Vermont’s Green Mountain National Forest with nearby access to the Long Trail (the real hiking trail, not just the road named after it) is Stratton Mountain - Windham County’s highest peak. Stratton is a beloved destination for both locals and visitors, known not only for its premier skiing and boarding but also for its year-round natural beauty - not to mention the culinary, shopping, and entertainment options offered in the Village at the base of the mountain. Stratton Mountain is near some of Vermont’s popular residential communities, including Manchester and Dover, and is an easy drive from New York City, Boston, and Montreal. From mountainside condos to secluded country homes, Stratton Mountain provides both seasonal and permanent residents with the quintessential Vermont life. Stratton Mountain Resort knows winter! 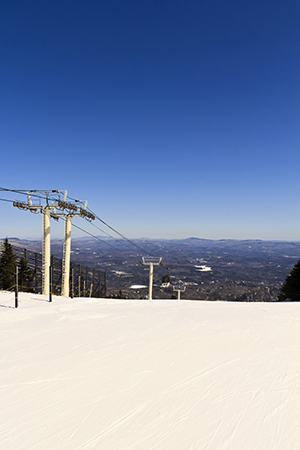 With over 600 skiable acres, 97 trails, a summit elevation of approximately 3,875 feet, and a vertical drop of 2,003 feet, Stratton provides some of the best skiing in the region. Stratton was also the first major ski resort to allow snowboarders. Whether you are drawn to the slopes or not, Stratton’s Village offers a jam-packed season of events, concerts, and dining, as well as a variety of retail shops for all to enjoy. Not a downhill skier but love the outdoors? Try cross-country skiing, snowshoeing, snowmobiling, or ride to the top and hike to the fire tower! It’s all right here at Stratton Mountain. Check out upcoming Stratton Mountain events! Once the snow melts and the temperatures start to rise, Stratton Mountain shifts gears and turns into a popular summer destination for fun and adventure. Stratton offers outdoor recreation from golf, tennis, and hiking to water sports, as well as a full slate of festivals, events, and more. Visit Stratton Village and rent stand-up paddle boards, kayaks, and bikes. Get outside and hike up the mountain, take a dip in the Stratton snowmaking pond, fish on Gale Meadows Pond, check out natural rock water slides and swimming holes at Pikes Falls, discover Jamaica State Park - the possibilities are endless! Wanderlust, a fantastic yoga and music event, takes place every summer and attracts visitors from all over the country and beyond. Whether you are looking to find a permanent residence or a vacation home away from home - Stratton is the place to be! TPW Real Estate’s Bondville office is located at the base of the Stratton Mountain Access Road, and we’d love to help you explore real estate opportunities in and around Stratton! Have questions? Contact us! TPW Real Estate has very deep roots in the Stratton Mountain area and can help you with all of your real estate needs anywhere in the area.